The strategic knowledge, research and training arm of UN-GGIM. The Bureau of the United Nations Global Geospatial Information Management (UN-GGIM) at its meeting convened in New York 7-9 December 2015, discussed the merits and establishment of an Academic Network to operate under the auspices of UN-GGIM, as a means to capture and include the role and contributions of academia in global geospatial information management. It was agreed that the chairs of the Regional Committees would submit an initial list of three to five leading Universities offering geoinformatics programs in their countries, and the Secretariat would augment this with a number of leading global universities with geospatial programs, particularly those that have been strong supporters of UN-GGIM over the past five years. An exploratory UN-GGIM Academic Network meeting was convened on 19 April 2016, as a side event to the Fourth High Level Forum on UN-GGIM in Addis Ababa, Ethiopia, from 18-22 April . The meeting was co-chaired by UN-GGIM’s inaugural Chair of the UN-GGIM Committee of Experts, Dr. Vanessa Lawrence CB, and Mr Greg Scott, the UN-GGIM Inter-Regional Advisor. It was anticipated that the Academic Network would operate along the same lines as the Joint Board of Geospatial Information Societies (JB-GIS), and would be able to self-organise and contribute to the activities of UN-GGIM in a similar productive manner. This first Academic Network meeting explored its objectives, terms of reference, and strategic advisory role in the global community. 5) Prepare and present a report and draft materials of the above tasks for consideration at the sixth session of the UN-GGIM Committee of Experts Meeting in NY in August 2016. Provide academic counsel and guidance to UN-GGIM concerning strategic knowledge, research, education and training and to serve as a strategic academic arm for UN-GGIM and its related organizations and affiliated members in achieving their visions and goals. Provide a forum for coordination and dialogue among academics and researchers from the geospatial information management community with a view to advance activities related to the administration, management, and use of geospatial information, and to identify and respond to challenges and opportunities in which UN-GGIM and related members can achieve their visions. Provide a platform that the needs of member countries for geospatial information data, technology, training and education, and the information of the capacities of academic network members are shared, so that geospatial data, technology, training and education can be widely used through this platform. To advise and support geospatial information and land administration training and capacity building programs of the UN-GGIM. To offer advice in response to UN-GGIM questions, identify and inform UN-GGIM concerning academic knowledge gaps or problems that may exist or arise, and propose initiatives as appropriate to address such questions and challenges. Bring to the attention of UN-GGIM and its regional organizations state-of-the-art research and academic trends on global geospatial information, or write white papers on any of related topics, and also offer training/ education in those fields. Create a communication platform for member countries to bring to the attention of the Academic Network key problems and areas of research that are of high interest to local, national and regional organizations. Address governance, data management, institutional, technology adoption and sustainability issues related to the management of geospatial information. Undertake work that is able to contribute to the Sustainable Development Goals of the UN and other areas as appropriate including, access to land, property rights, ownership, land degradation, rapid urbanization, and climate change, in coordination with other expert entities. Promote and encourage close collaboration between Universities and their national geospatial counterparts. Encourage the development and sharing of geospatial analytics. Review of the current UN-GGIM WGs’ work plan to identify areas for support and input. Promotion of the Network to potential member institutions. Registry of current capabilities, degree programs, training programs, research, and courses, relevant to UN-GGIM gathered as part of the membership application process as well as through additional means. Establishing a Registry for Education, Training and Research. The Academic Network will report to the UN-GGIM Committee of Experts and High Level Forum. 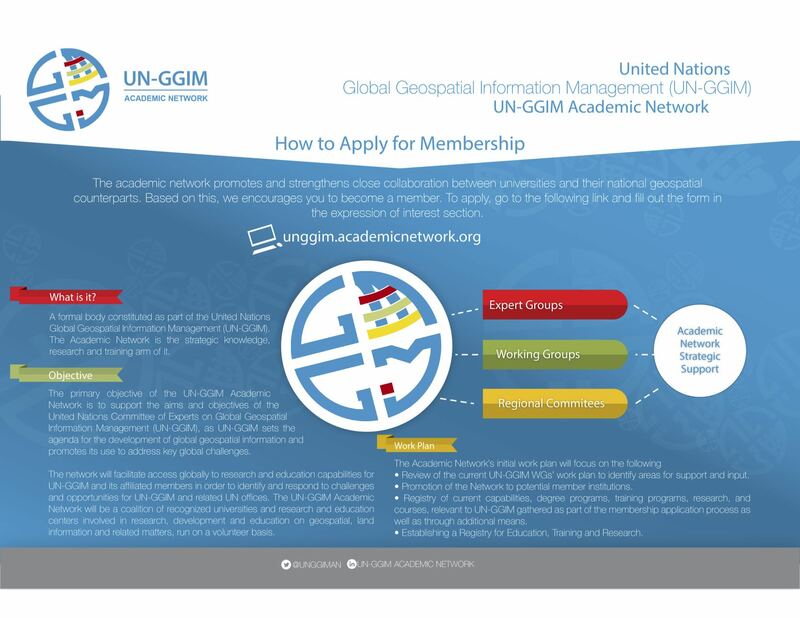 The Academic Network will normally operate virtually and will meet in concurrence with related meetings of geospatial information, and also officially meet during each UN-GGIM Committee of Experts and High Level Forums. The UN-GGIM website, Skype, WebEx, Google Drive and DropBox, in addition to other relevant telecommunication tools will be used by the Academic Network for communication, collaboration, knowledge management and information sharing and dissemination. Thank you to all the wonderful speakers and participants at the UN-GGIM Academic Network Forum about ‘The SDGs Connectivity Dilemma: Urban Settlements, Resilience, and Sustainability’ on the 30th July 2018 at UN Headquarters, New York. The forum brought together over 60 delegates and geospatial experts and academics from around the world, providing a rich discussion on the forum themes: the unique challenges facing urban communities and settlements; how geospatial information supports and informs inclusive urbanisation and resilient development; and how to develop roadmaps for a more sustainable and resilient future, especially in light of growing disaster risk. Our thanks to all involved in this rewarding annual event, and stay tuned for the upcoming summary report. Thank you to all the wonderful speakers and participants at the UN-GGIM Academic Network Forum about 'The SDGs Connectivity Dilemma: Urban Settlements, Resilience, and Sustainability' on the 30th July 2018 at UN Headquarters, New York. The forum brought together over 60 delegates and geospatial experts and academics from around the world, providing a rich discussion on the forum themes: the unique challenges facing urban communities and settlements; how geospatial information supports and informs inclusive urbanisation and resilient development; and how to develop roadmaps for a more sustainable and resilient future, especially in light of growing disaster risk. Our thanks to all involved in this rewarding annual event, and stay tuned for the upcoming summary report.